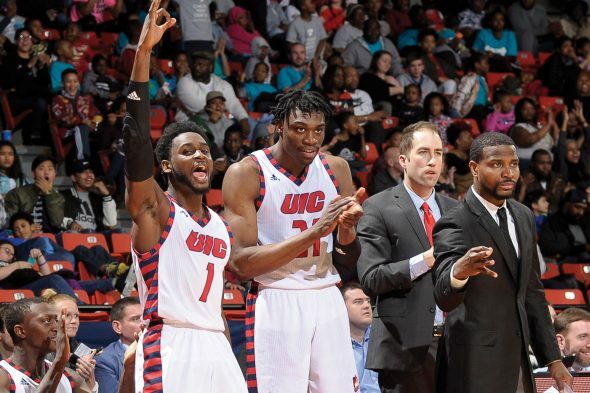 Dikembe Dixson and Marcus Ottey scored 20 points each, leading a torrid second half that saw UIC (17-12, 12-4 HL) lead by as many as 17 before defeating Detroit Mercy (8-21, 4-12 HL) 94-87 at UIC Pavilion Monday night. UIC will continue its homestand Friday night against Horizon League Northern Kentucky. They face Wright State at 5 p.m. Sunday during the #PackThePav Family Day event; family activities begin at 4 p.m. in the Pavilion Concourse. Admission is free for UIC students with a valid i-card. Staff and guests can purchase tickets online at communityrelations.uic.edu Use the promo code PACK for a special $5 price. On Monday, the Flames shot more than 54 percent for the game, and their second-half numbers were even better, at 63 percent overall, and an eye-popping 73 percent from 3-point distance. Jordan Blount contributed a double-double (15 points and 10 rebounds), and Michael Diggins had a career-high 11 points. UIC blocked eight shots to overcome a game-high 30 points from Detroit Mercy’s Kameron Chatman. Detroit Mercy kept the pressure on the Flames with a couple of early 3-pointers. Jordan Blount made a running one-hander in the lane, and Ottey had a triple of his own, but the Titans held a 10-8 lead at the first media timeout. The visitors stayed hot, building a lead of as many as 10 points and forcing UIC head coach Steve McClain to call timeout to regroup his squad. Immediately after the timeout, Ottey made a layup and Michael Diggins turned a steal into a three-point opportunity. But Detroit Mercy maintained a 12-point cushion. It took UIC less than four minutes to erase the Titans’ lead. Blount made a reverse layup off a feed from Tarkus Ferguson, and later Tai Odiase upped the ante with a reverse jam on an alley-oop from Ferguson. Three-point plays by Diggins and added to the 19-3 run. The teams traded the lead through the first six minutes of the second half. Blount then helped the Flames establish a seven-point lead by scoring six straight Flames points — and grabbing five rebounds — in nine minutes. Also critical to the spurt were two blocks by Clint Robinson, both on would-be layups and two by Odiase. UIC’s lead extended continued to build the lead to 17 points, until Detroit Mercy went on a 7-0 run. In the final minutes, Dixson made a three-pointer, then a dunk off of a Titan turnover, to give the Flames the breathing room to win the game.